A lab grown diamond pendant necklace featuring round brilliant diamonds lightly channel set in two interlocking infinity symbols. Available on a 16", 18", or 20" chain. Available options: platinum, 14k or 18k gold: white, yellow, rose. Our friendly Concierge are here to help you build a unique, stunning piece of fine jewelry. Free shipping and 30 day returns. Ada Diamonds Design Description- Part of Ada's automotive-inspired jewelry collection, the Double Infinity Necklace celebrates Rolls-Royce Motor Cars Ghost with round brilliant lab diamonds lightly channel set in two stationary, interlocking infinity symbols. Available on a 16", 18", or 20" chain in 14k white, yellow or rose gold. 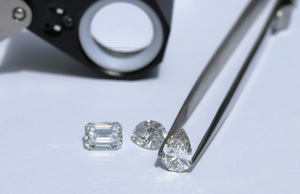 Starting at pricing assumes GH VS lab grown diamonds set in 14kt white, yellow, or rose gold. Additional setting fees for 18kt: $150, for platinum: $300.